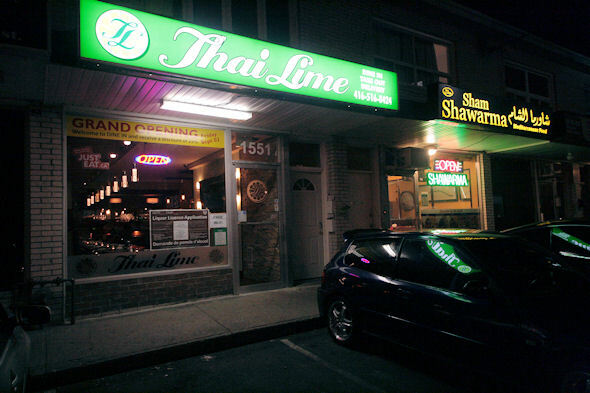 Thai Lime, now open in the Junction Triangle , is serving up something new to a neighbourhood dominated by sports cafes and churrasquieras. 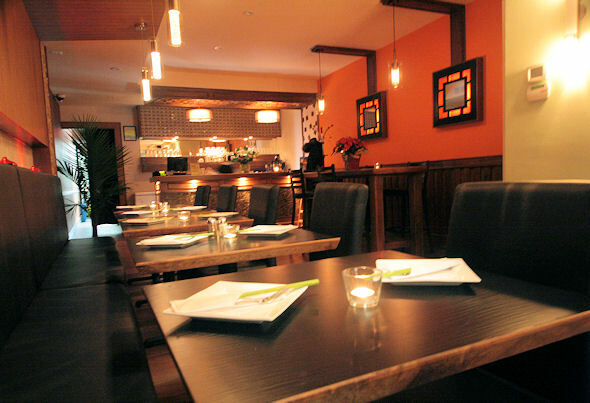 Located in a strip mall, and according to nearby customers, a reincarnation of a fish & chip shop, Thai Lime has done a great job renovating the place. There are no signs of its former life, and more ambiance than I was expecting. We took a seat by the door as it afforded me the best lighting for pictures (thanks to the fluorescent kind coming from outside) but it also afforded us a nice blast of cold air every time a customer came or went, but I can only fault winter for that. Nicole, the sole server for the night presented us with our extensive menus and gave us time to make our selections. They have applied for their liquor license but as the application is still in the works, there would be no Singha with our meal that night. We went with some of the basics; Veggie Pad Thai ($8.99), Green Curry Chicken ($10.49), Thai Eggplant ($8.99) and of course a side order of rice ($1.29). 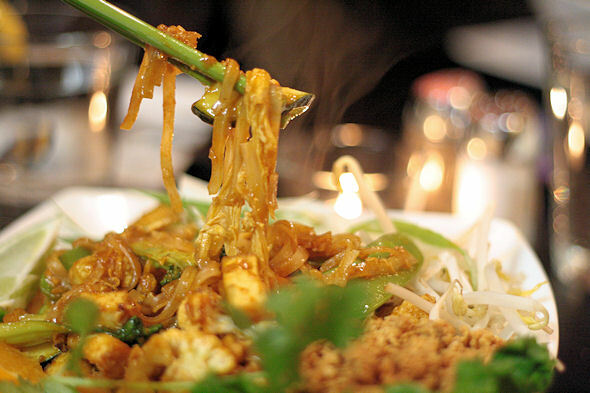 Now I hardly consider myself an expert on Pad Thai , but I do love the stuff. One time, on a lengthy layover in Bangkok, I left the airport and took a cab downtown so I could buy some from a street vendor. I forgot that leaving the airport meant I would have to pay the departure tax I could have avoided had I stayed put and bought my lunch from a vending machine. Figuring this in, plus the cab fare, that Styrofoam container of Pad Thai ended up costing me almost 1000 baht...100 times more than its street value. I have no regrets. Now although I wouldn't pay the equivalent of over thirty Canadian dollars for the same dish at Thai Lime (but that goes without saying), it was decent. The huge portion was loaded with tiny squares of tofu and it wasn't tomato-y as Pad Thai sometimes disappointingly is. 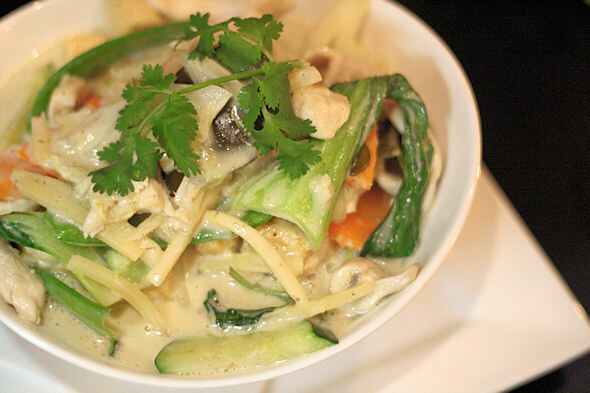 The green curry was my friend's favourite dish of the night. It had just the right amount of lemongrass, but I would have preferred it to be a bit on the spicier side. I'm sure the chefs play it safe in this department however, and I probably could have asked for them to increase the heat had I given it some thought. My favourite dish of the night turned out to be the eggplant. 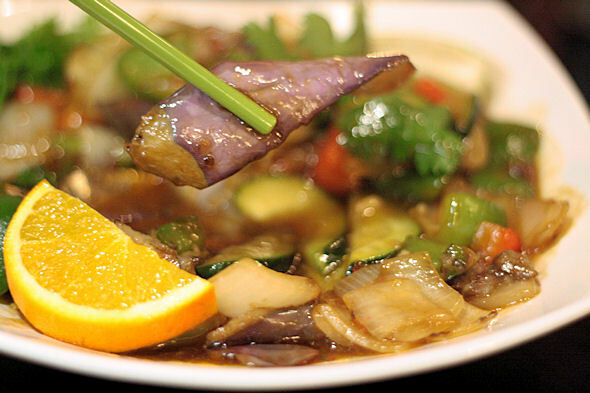 It was both sweet and spicy with more of a kick to it than the curry, and although eggplant was indeed the predominant vegetable, it wasn't the only one. Being a Monday night, it was quiet but we were never the lone diners, and Nicole was continuously packing up take-out and delivery orders behind the bar. It seems the neighbourhood residents are liking the change from barbecued chicken. A family with small children came in as we were leaving. Now, Thai Lime doesn't have a kids menu, but I overheard Nicole working with the parents to find something on the menu their youngest wouldn't make a face at. I'm guessing it involved a lot of noodles, and very little, if any, spices. 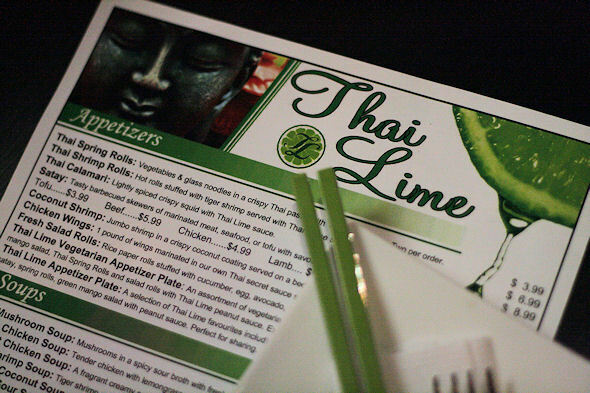 Overall we enjoyed our time at Thai Lime. The one suggestion I would make involves the condiments on the table. Right now salt and pepper are the only occupants, but a little caddy offering up others (chilis, peppers, sauces etc.) would be a nice touch. The evening was capped off by a very pleasant surprise. 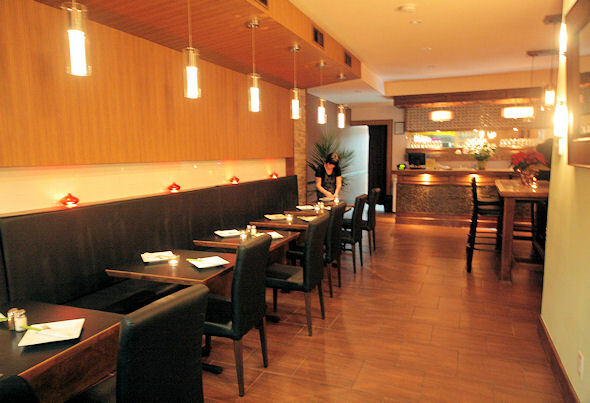 Upon delivering the bill, Nicole informed us that by the simple act of dining in, we saved 25%! Our total bill came to a few cents over $25 - what a deal. We were stuffed and still had enough left over to have generously portioned lunches the next day that would induce jealousy in sandwich and frozen meal eating co-workers. Footnote: As we had eaten all of our rice with dinner, they threw in an order with our leftovers for free. It's the little things folks.